Although I've posted these fellas for sale, I felt like they deserved a bit of a designer's chat in this forum, too. First off, a bit about the motivation behind these guys. I'm not overflowing with space, so I only collect Cyberverse - but after seeing (and enjoying!) 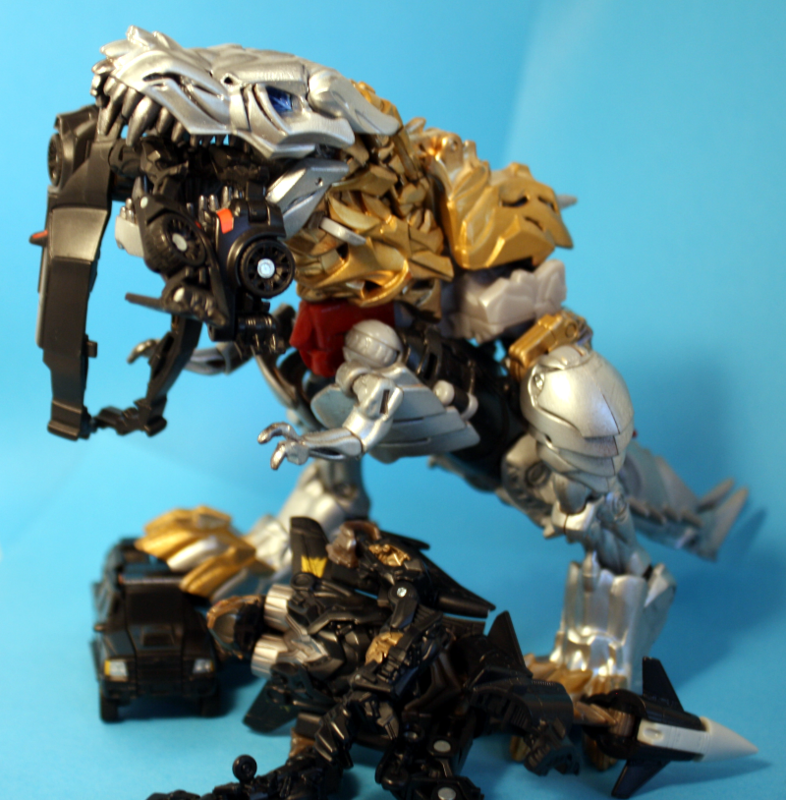 the AoE Dinobot designs, I really wanted to do something with them. In the end, I decided to customize a couple, then sell them - I get the fun of tinkering with them for a bit, then send them off to a good home. Anyways, the obvious paintjob for these guys is something G1-esque, so I went along with that. 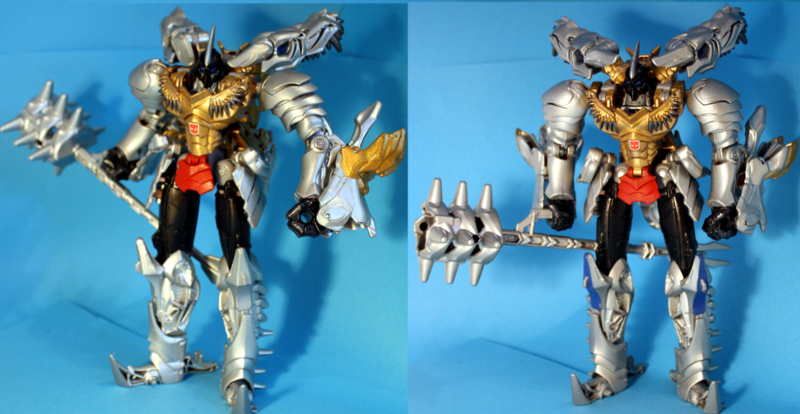 Mapping the G1 colors to this mold was interesting; Grimlock's red "pants" were something that took a bit of thought. Do I paint the ribcage bits red to give him more pants, at the cost of giving the dino-mode a red chest? In the end I went with just painting the groin-piece red. The knees were another point of interest. Grimlock's first toy had blue, red and green details on the knees - at first, I considered putting stripes of those colors on the knees of the AoE guys. However, I remembered that in the cartoon, Grimmy just had blue spots on his knees. A put blue spots on one guy, and left the other with silver - I'm still not sure which looks better, but at least I had the opportunity to experiment! On that note, you can see some experimentation happening with the feet - one with blingier claws than the other. Personally, I prefer the guy on the right a bit, but that could just be me. The red "core" created by the red crotchy-bits of that Grimlock look kinda neat in dino-mode, even if it's not G1-accurate. I had a bit more to say about paint types/combinations, but seeing as I run out of interesting images, I think I'll save that for next time Don't want too much of a wall o' text. 3,771 pages were recently viewed by 653 unique visitors. This page was viewed 1 times on Friday, April 19th 2019 1:43am CDT. © 2019 Seibertron, Inc. DBA Seibertron.com. All Rights Reserved. Established June 2000. Seibertron.com is owned by Ryan Yzquierdo.